Who invented the 3D Printer? The name of the person credited with inventing the 3D Printer is Charles (Chuck) Hull (1939 - present). Chuck Hull is not only famous as the American inventor of the 3D Printer but also as a engineer and co-founder of 3D Systems Inc.. When was the 3D Printer invented? Chuck Hull invented the 3D Printer in 1986, and referred to his invention as 'stereolithography'. The invention of the 3D Printer originated in America and is considered a marked achievement in the field of Computing and Technology. Definition of the 3D Printer: The 3D Printer is defined as a three-dimensional printing uses a printer to add a third dimension, volume, to create three-dimensional, physical object, layer by layer. A 3D Printer uses custom material such as plaster, metals, thermoplastics, ceramic powders, glass or even foodstuffs like chocolate to produce a 3D model. The process is known as stereolithography which is defined as a a method for making solid objects by successively "printing" thin layers of the ultraviolet curable material (able to be hardened) one on top of the other. Fact 1: Who invented the 3D Printer? The 3D Printer was invented by Chuck Hull in 1986 during the Technology and Information Age of invention. Fact 2: Who invented the 3D Printer? Prior to the invention of the 3D Printer (meaning 3 Dimensional printer) in 1986 it was only possible for document or photo printers, which could only print two dimension. Fact 3: Who invented the 3D Printer? A one dimensional (1D) shape is a flat line segment that only one dimension, the length. Two dimensional (2D) objects have measurable dimensions of length and width, such as a square. Three dimensional (3D) objects have a third dimension - depth - such as a cube. Fact 4: Who invented the 3D Printer? Depth perception, the visual ability to perceive the world in three dimensions, provides an idea of the length, width and height of an object. Fact 5: Who invented the 3D Printer? The invention of the 3D Printer met the need for a CAD (Computer-aided design) and CAM (Computer-aided manufacturing) system capable of rapidly, reliably, economically and accurately designing and fabricating three-dimensional objects. Fact 6: Who invented the 3D Printer? The inventor of the 3D Printer, Charles (Chuck) Hull, was born on May 12, 1939 in Clifton, Colorado, United States. Fact 7: Who invented the 3D Printer? The early years of Chuck Hull were spent in Clifton, Colorado, United States where he was raised by his parents, Lester and Esther Hull. Chuck Hull was educated at University of Colorado in 1961 where he received a BS degree in engineering physics. Fact 8: Who invented the 3D Printer? Following his education his first job was as a senior engineer at Bell & Howell. He went on to become an engineering manager at DuPont’s Photo Products Division and then joined UVP Inc., a systems manufacturing company, in San Gabriel, California. Fact 9: Who invented the 3D Printer? While he was at UVP Inc. Chuck Hull developed and patented the stereolithography process, the first commercial 3D printing technology. Fact 10: Who invented the 3D Printer? He was driven to make the invention because he became increasingly frustrated that the production of small plastic parts, for prototyping new product designs at UVP Inc., could take up to two months. Fact 11: Who invented the 3D Printer? He worked hard on his invention for over a year and, using his stereolithography process, Chuck Hull first printed a small black eye-wash cup. Fact 12: Who invented the 3D Printer? Chuck Hull coined the term “stereolithography” in his U.S. Patent 4,575,330 entitled "Apparatus for Production of Three-Dimensional Objects by Stereolithography" that he filed on August 8, 1984 and was issued on March 11, 1986. Fact 13: Who invented the 3D Printer? Chuck Hull defined stereolithography as a method and apparatus for making solid objects by successively "printing" thin layers of the ultraviolet curable material one on top of the other. Fact 14: Who invented the 3D Printer? The prime object of his invention was to harness the principles of CAD (computer generated graphics), combined with UV curable plastic and the like, to simultaneously execute CAD and CAM, and to produce three-dimensional objects directly from computer instructions. Fact 15: Who invented the 3D Printer? After patenting the invention, Chuck Hull founded 3D Systems in Valencia, California in 1986 order to commercialise the new method of production. Fact 16: Who invented the 3D Printer? 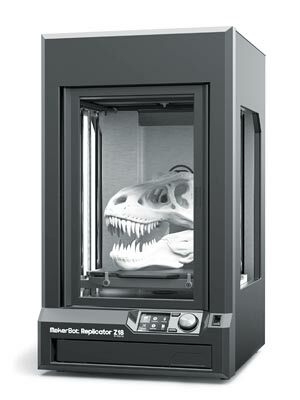 The first commercial 3D Printer was launched in 1988 and the printers, materials and software were a huge success with manufacturers in the car industry such as Mercedes-Benz and General Motors The product also attracted sales in the aerospace sector and for companies designing medical equipment. Fact 17: Who invented the 3D Printer? Chuck Hull coined the term “stereolithography” he pave the way for what we now know today as additive manufacturing (AM) – or 3D printing.